The game of Tennis has a great fan following all over the world, especially in Canada and the United States. The four biggest tennis tournaments in the world are referred to as Grand Slams and they are the Australian Open, French Open, Wimbledon and the US Open. Apart from these four grand slams, the Association of Tennis Professionals (ATP) organizes a number of tournaments all over the world. The game is regulated by the International Tennis Federation (ITF) and features matches from different divisions such as men’s, women’s, men’s doubles, women’s doubles and mixed doubles. Tennis matches are held in a number of different countries throughout the year and hence the online sports betting websites always tend to feature most of these well known tournaments. However it is the Grand Slams which invoke the highest interest in Canada and as a result these Grand Slam matches attract a lot more wagers. Canada is being represented with the rise of stars like Eugenie Bouchard and Milos Raonic staying in the Grand Slam tournaments for longer. Some of the tennis bets offered include the winner of the match, number of aces served, number of sets played and championship winner. 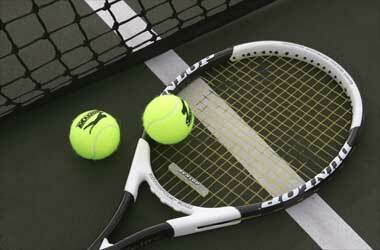 The sport of tennis has come under the radar during the last decade due to a number of match fixing allegations. There has been more than one active tennis player who has alleged that some of the top tennis professionals are involved in match fixing. The European Sport Security Association (ESSA) is spearheading a campaign to remove match fixing from tennis and crack down on the illegal betting market that is prevalent throughout the world. Which Tennis Tournaments to Bet on? How do Tennis Handicap Bets Work? What’s the Best Tennis Betting Strategy? What Factors Matter When Betting on Tennis? How to Find Value Bets in Tennis? Canadians love to wager on tennis matches and have a number of regulated online sports betting websites to choose from. Sports betting websites like William Hill, Bet365, Betfair, Paddy Power and 888 Sports offer Canadians the option to place bets on tennis match online or via their mobile app which is available for both iOS and Android users. Betting on Tennis matches can be a less risky proposition especially when one is placing a wager on top seeded players who are playing lower ranked opponents. The odds are always in favor of the higher ranked player and hence the payouts are less but a lot more certain. The men’s division has been dominated by Novak Djokovic, Andy Murray and Roger Federer while the women’s division has been dominated by Serena Williams, Maria Sharapova and Venus Williams for a number of years. Most players tend to bet in favor of these higher ranked players especially in the qualifying rounds as their lower ranked opponents are usually blown away. Take the time to see the ranking of each player before you place a bet. Place bets on the top 10 ranked players as it is a safer bet albeit a lower payout. Don’t forget to place bets on the four Grand Slams. There is a huge interest in betting on Tennis Tournaments and Tennis Events, as everyone who enjoys this sport will usually have their own personal favourite player, and as such we suggest you should look around to ensure you get the best odds on any Tennis match you wish to place a wager on. Further down this web page we have a list of the best Tennis betting sites around and for a limited time a huge array of free Tennis bets and bonuses are available on the Australian Open and other grand slam tennis events to new customers of those betting sites we list. The major Tennis Opens such as the US Open are where the most money is placed on the game of Tennis whilst the Wimbledon event is another which does get a lot of money wagered up on it. The singles and doubles are other matches, which do manage to get a lot of betting turnover, and should you fancy placing a wager on any Tennis event out betting sites listed below will offer you a whole array of odds and betting markets. It is probably the different matches on any Tennis Tournaments like the French Open that you will want to place a wager on and as such you can opt to be on the outright winner of any one single match or the outright winner of any Tennis Tournament, or should you prefer you will also find markets who offer on the set betting. We do of course invite you to take a look at our betting sites reviews, below are some of the currently available special offers available to anyone signing up to any of our top rated online betting sites today. Bet365: You will always be able to find exactly the type of Tennis bet you wish to place over at the Bet365 betting site, and if you do that today then you are going to be able to claim rather generous 100% match bonus bet, check out the Bet365 betting sites website for all of the terms and conditions of this easy to claim free bet bonus offer. Ladbrokes: For a completely hassle free type of betting experience, and a huge array of Tennis related betting opportunities visit the Ladbrokes betting site for they have a very easy to use betting interface that can now be accessed not only on any computer but also on your mobile phone, and if you act today and sign up and start to bet with Ladbrokes you are going to be able to claim a C$120 free bet. Betway: The Betway site is the place to visit for generous free bets and a huge Tennis betting market, they are offering you the chance of claiming a C$50 free bet and always have a very wide range of betting markets open, their betting platform is very easy to use and you should get the hang of it in no time. 888 Sport: You will never go short of Tennis related betting opportunities or value for money if you join up to the 888 Sport betting site, this is of course the online betting operation owned and operated by the biggest online casino site, that being the 888 Casino and as such they have pushed the boat out in regards to their current betting bonus offer which can reward you with up to CAD88 in free bets and free betting bonuses, take a look over their website for more details. BetFair: When you start to wager at BetFair their betting exchange lets you place bets on who you think will win any Tennis event, whilst also allowing you to pick who you think will lose such any event, and as such you can always hedge your bets and pick up some excellent value from your wagers, visit their website today and you could claim a CAD20 free bonus bet! Betdaq: If you fancy a wager to win or lose on a Tennis match via another of our top rated betting exchanges then make sure you add Betdaq to your list of sites to visit and investigate, for they too have a generous sign up bonus and theirs is valued at a whopping CAD200 in free bets and as such it really is one bonus you should consider taking one day soon. To make sure our listed betting sites are the best around we have taken the time and effort to carefully vet each site we showcase to you, and this enables us present to you only the best of the best in regards to online betting sites and what they have to offer you. All of the above sites do of course accept and allow Canada based sports bettors to sign up and wager at their respective betting sites, whilst using CAD as the base currency of their betting accounts, and each of them have a range of free bets and special bonuses to give to you when you do sign up. Be aware that the offers listed may change at any time, so do checkout the websites of any betting sites bonus offer that may be of interest to you to see if it is still currently on offer and available. The most popular events are the ATP (men) and the WTA (women) tours, which offer a variety of bets and resources to help you do better. Other than that, the ATP Challenger and IT Futures (both men’s) are where most of the other bets happen, since the diversity of betting options is just as good. Tennis Handicaps bets are when sportsbook give one tennis player an advantage over the other. So, let’s say you have a match with Player A (the favorite) against Player B (the underdog). To even out the score and offer a more exotic bet, Player B will be given a +1.5 set advantage over Player A, who will start with a -1.5 set handicap. Once the match ends, the betting provider will apply the handicaps to the final score and consider that as the official result. This way, if you bet on the lesser player (Player B) you can win money even if the official match ends up in Player A’s favor. The starting point, as with all sports, is to learn the rules of the game, know your players well, their stats, style, form, and head-to-heads, and handpick your bets according to their value and the markets you have experience in. And apart from being extensively backed up with data, the remainder of your strategy should consist of managing your budget smartly, keeping track of your wins/loses, scouring for good early odds, and keeping your eyes on long-term gains. The key factor to consider before you make a bet is how fit are your players for the upcoming match. Things like long-distance travel and playing for days at a time can be very negative for some players, while others will be more resistant to these factors. That’s why it all comes down to sticking to a group of players that you know well. Other than your players, it’s also good to note the venue, since some tennis pros are statistically more successful indoors than out, but also the surface, which to most pros isn’t that important of a factor but is to other prominent tour players who prefer one type of surface over another. Any successful sport betting strategy is based on finding value in bets, and tennis is no different. If you want to find whether your bet is a value bet or not, there is a simple formula that can help you on your way. However, to do things right, you have to do a bit of research and estimate your own probability. If the resulting number is higher than 0, you have found yourself a value bet. Of course this is a simple example, but it’s what basic value bet strategy relies on.